Last update: April 26, 2013. Follow the My Brother Sam is Dead Facebook page for the latest research. I'll be using Facebook a lot more in 2013 and will be sharing my new videos there too. The authors employ an interpretative storyline, focused on the hardships faced by an Anglican family whose eldest son has run away to join the Patriot troops, to portray the American Revolution as a civil war. Christopher Collier is a retired American history teacher and the emeritus Connecticut State Historian; James Lincoln Collier was a journalist and well-regarded author of children’s books. The Collier Brothers (James and Christopher) were personifying the War of Independence in writing this novel and they did a very good job of it. Their choice of characters, story line and setting create a captivating saga, rich with courage, drama, and intrigue. "my brother Sam is dead" is a classic, well deserving of the awards and accolades it has received. 1780 Map of West Chester and Fairfield County showing Redding, Ridgebury, Salem, Verplanck Point. Click here to view a larger version of this map with locations mentioned in the novel. 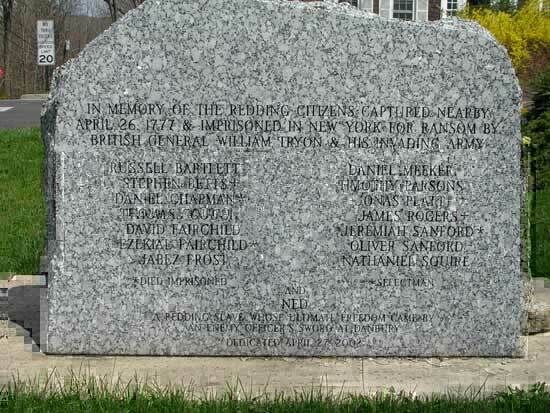 Stone dedicated in 2002 reads: "In memory of the Redding citizens captured nearby April 26, 1777 & imprisoned in New York for ramsom by British General William Tryon & his invading army." At the bottom center you will see the text: "And Ned" That is the same Ned as in the novel My Brother Sam is Dead. Because of the novel's content, most notably Ned's execution and a beheading, it has been the frequent target of censors and appears on the American Library Association list of the 100 Most Frequently Challenged Books of 1990-2000 at number twelve. My Brother Sam is Dead is told in the first person by Tim Meeker. It recounts the hardships endured by Tim and his family during the Revolutionary War. When Tim's older brother Sam joins the rebel forces, it impacts the rest of his family who wish to remain neutral and/or avoid war with England. Tim's family is Anglican and thus loyal to the Church of England; a split with England would greatly affect them. Tim Meeker is a metaphoric symbol of one third of the American population during the war. He portrays the American that is uncertain which side is right and does not wish to choose a side until forced to, sometimes referred to as a "fence-sitter". Sam and Life are examples of the other two thirds: the Rebel/Patriot and the Tory/Loyalist. Through Tim Meeker we learn of the issues, the concerns and the conflicts of the rebellion on a personal level. Each chapter touches on a number of topics and issues that provide readers with a better understanding of the affects the American Revolution had on individuals, their families, their churches, their towns, their neighbors...in short, it allows readers to see the war from the position of those that lived through it. This is one of the greatest strengths of the novel; it quietly weaves all of the topics and issues of the early years of the American Revolution into a tragic story of a 10 year old boy’s role in a war he doesn't understand. My Brother Sam is Dead begins in April 1775 and ends in February 1779...a very volatile period of the American Revolution as it was not clear which side would win the war. Many were either still confused about the issues or unwilling to solidify a position on the issues. As the story unfolds the consequences of the war prove devastating to the Meeker family as the rebelliousness of Tim’s brother, Sam, and the pacifist postion taken by Tim’s father, Life, result in the ironic deaths of both, symbolizing the atrocities and unfairness of war. Trying to stay neutral while living in a town that everyone assumes is a loyalist settlement. Redding's Anglican church leader and its members preferred not to rebel from England. This was well known across the State and resulted in Redding Ridge being labeled as an area heavily settled with loyalists/tories. Currency Issues-The Meeker's own a tavern/store, and keeping it running is hard work. Even prior to the Revolution, to make money, each year Tim's Father and brother Sam would travel to New York State to sell cattle they received from people who owed them money. During the war it becomes even more difficult as paper money and commissionary notes destroy local economies and businesses. Sacrifices- Since Sam has sided with the rebels and wasn't there, Tim's responsibilities have increased ten-fold. Jobs Tim and Sam used to share all now fall on Tim's shoulders. Father (Life) takes Tim on his yearly cattle run to New York. They have to travel without a Brown Bess (musket/gun used for protection), which Sam had recently stolen. Life is captured on their return trip, leaving Tim to take care of his mother and himself for the rest of the novel. Tim is forced to grow up over night seeing he is now the man of the house, with his father in prison and Sam fighting with the patriots. Committees of Safety- These committees were formed early in the war to disarm people who could potentially give aid to the British. Life is an Anglican and thus seen as a Loyalist/Tory, by the local Committee of Safety which comes to the Meeker Tavern to disarm him. When Life tells them his son has sided with the Patriots and taken his gun, they initially don't believe him and rough him up. Cowboys and Skinners- Life is captured on their way back to Redding on their cattle run by cowboys. Cowboys and skinners were groups of raiders who harassed and plundered the rural districts of the boundary between American and British forces in Westchester County, New York. Westchester County, was the so-called "Neutral Ground" seeing the British were in the Bronx and the Americans in Peekskill, New York. The British march though Redding and capture several Patriots there on their way to Danbury, CT to destroy the rebels/Patriot's provisions of war which were being stored there. The Patriot soldiers arrive in Redding in pursuit of the British and Sam is with them so he gets to see his mother and Tim again. Winter Encampments- General Israel Putnam's division of the Continental Army encamped at Redding in the winter of 1778-1779 and Sam Meeker is a soldier in one of Putnam’s camps. One evening, Sam slips away from camp and returns home to spend time with his family. While they discuss the war and related topics, Sam hears commotion outside…Patriot soldiers are attempting to steal their cattle! When Sam intervenes he is out numbered and beaten. Back at camp he is falsely accused of and court-martialed for deserting camp and stealing cattle. General Putnam having long dealt with ill-equipped troops, deserters and traitors, feels he needs to set an example in order to maintain discipline amongst his army. Sam, unfortunately, becomes one of the two examples that winter, and is executed. Hardships of War- Tim's Mother goes a little crazy due to the stress of losing her husband and son to a war she doesn't support. Tim lives to be very old. He had a wife, children, even grandchildren. But his mother never recovers from Life and Sam's deaths. "The Political division between Patriots and Loyalists forms the thematic backbone of the whole story. The national anti-imperial conflict is personified in the conflict between father and son...We portray the war...as both an anti-imperial war for national liberation and a civil war that divided a people against itself." I will continue to provide free content here at the History of Redding, but for those who wish to have access to all I know, I have created a Dropbox account that has everything I've found and created. All can be downloaded from the Dropbox. Access is $12.99 (see below for deep discount) and that is unlimited access. See the video below or read the Word document for details of what's included. and a why I created this resource. Are you a teacher or parent? Email me at bcolley@colleyweb.com subject "MBSD Dropbox" and I will send you a special code that will give you free access if you promote my Dropbox. And, if people use your special code, you will be paid a % of the sale. It's a great win/win. Please feel free to email me with any questions @ bcolley@colleyweb.com. The Meeker's of my brother Sam is dead were fictional, however, there is a real-life similarity via John Meeker's son-in-law Jacob Patchen. Jacob Patchen married Abigail Meeker in 1787. Jacob was only 12 years old when he was captured by the British Army during their march to Danbury. He escaped and joined the Continental Army in 1781, serving until the end war. Jacob's family were Loyalists/Tories, his father fled to Western New York and his uncle Andrew fled with his family too. The other real-life similarity to Sam Meeker in my brother Sam is dead was, James Sanford, who enlisted with the teamsters for General Enoch Poor's New Hampshire brigade while they encamped at Redding. James' enlistment was contrary to the political loyalties of his family. His younger brother John, who is said to have visited him at camp everyday, is a good candidate for the real life Tim Meeker. Below are definitions and meanings of the character names in my brother Sam is dead, that may explain why the name(s) were selected by the Collier brothers. *keep in mind this is my own presumption, I do not know this to be factual. 1. Showing patience and humility; gentle. 2. Easily imposed on; submissive. Eliphalet (Life): Hebrew. Meaning: God delivers me. Susannah: Hebrew. Meaning: Lily. In the apocryphal Book of Tobit Susannah courageously defended herself against wrongful accusation. White lilies grew in the Biblical city of Susa in Persia. In the New Testament, Susannah was a woman who ministered to Jesus. She does defend herself for working on Sunday (a sin), after Eliphalet disappeared in New York State: "God will forgive us, Tim, Don't worry about it, I'm sure of that." Sam: Hebrew. Meaning: The literal translation of Hebrew Samuel (Shemu'el in Hebrew) is Name of God (from Shem, meaning name). However, in some contexts Shem can also mean son, and hence Samuel would mean son of El or son of God. Uncle Sam, a personification of the United States government is fitting as well. "I knew that God could shoot bolts of lightning if He wanted to, but I didn't believe that He ever did. What worried me was that maybe God would punish him (Sam) by getting him bayonetted by a Lobsterback. I knew that God did things like that because I saw it happen once…"
Information on the Episcopalian Meeker's comes from Frank B. Rosenau's Christ Church Parish: The first 250 years history booklet which notes: The early Meeker's were members of the Christ Church on Redding Ridge. They must have been messy writers because none of their first names are listed- Frank B. Rosenau only refers to them as "the early Meeker's". John Meeker is the first Meeker named. In 1833 after the fire at the church John Meeker and his family formally withdrew from the Christ Church for reasons unknown. John was the treasurer and clerk for the church and left on bad terms- he didn't return the church money nor documents after he withdrew. He's called a "villain" in the history booklet. Benjamin Meeker and wife Catherine Burr were admitted church-members June 4, 1747. Their children were: Witely, baptized June 7, 1747. Esther and Eunice, baptized August 13, 1755. Azariah, baptized February 5, 1769. Daniel Meeker was married by Rev. Nathanial Hunn on July 10, 1744 to Sarah Johnson. Their children were: Elnathan baptized July 26, 1747. Jared, baptized January 29, 1749. Rebecca, baptized January 20, 1751. Lois, baptized March 28, 1753. Josiah, baptized July 17, 1757. David Meeker was married by Rev. Nathanial Hunn on October 31, 1744 to Hannah Hill. Joseph Meeker appears as early as May 4, 1735, when his son Isaac was baptized. A Gristmill on the Saugatuck River, off Diamond Hill Rd. was willed to Joseph's wife in 1752, suggesting he operated the mill at some point between 1735 and 1752. Robert Meeker was married by Rev. Nathanial Hunn on September 19, 1746 to Rebecca Morehouse. Seth Meeker was a Private, in the 4th Connecticut Militia, Fishkill Campaign, 1777. Stephen Meeker was a member of the Continental Army and later joined French commander Marquis de Lafayette's elite Light Infantry Battalion. His service is as follows: 5th Regiment Connecticut Line, Northern Campaign, 1775. Does not appear on the rolls of May, 1778. Appears on a list of deserters previous to January, 1780. Appears on rolls of Captain Parsons' Company, 2nd Regiment, Connecticut Continental Line, June 1780, as Sergeant. His Regiment was consolidated with the 9th in 1781 as the 3rd Regiment, and Stephen Meeker was drafted from this Regiment into the Light Infantry Battalion, commanded by Marquis de Lafayette, when he was promoted to be Sergeant. His company formed part of the column of Major Girnat which stormed a redoubt at Yorktown, Virginia. Squire William Heron lived just south of the Anglican/Episcopal church on Redding Ridge. He was a native of Cork, Ireland; a graduate of Trinity College, Dublin. He has been described as: a man of much ability and force of character. In appearance: short, portly, and florid, with a deep bass voice and a countenance well calculated to disguise the true sentiments of the owner. Heron's pre-Redding days are a bit enigmatic. He never spoke of them except to say that he was a native of Cork, Ireland, and had been educated at Trinity College, Dublin. It is said that Squire Heron taught at the Academy in Greenfield Hill before coming to Redding, and had also surveyed the old stage route from New York to Boston. The precise date of his arrival in Redding is absent from record, but most agree it was prior to the Revolution. A notation in Frank B. Rosenau's Christ Church Parish: The first 250 years indicates Heron acquired the property of John Lyon, when Lyon fled Redding and joined British forces in Long Island, and the property was confiscated by the state. Lyon had purchased the home from Anglican Rev. John Beach in 1772. After their departure (British marching through Redding to burn Danbury in 1777) nothing further of a warlike nature occurred in the town, until the encampment in Redding in the winter of 1778-9 of General Putnam's division of the Continental Army. General Israel Putnam's division of the Continental Army encamped in Redding in the winter of 1778-1779. This division was comprised of General Poor's brigade of New Hampshire troops under Brig. General Enoch Poor, a Canadian Regiment led by Col. Moses Hazen, and two brigades of Connecticut troops: 2nd Brigade Connecticut Line regiments commanded by Brig. General Jedediah Huntington, and the 1st Brigade Connecticut Line regiments commanded by Brig. General Samuel H. Parsons. This division had been operating along the Hudson (Eastern New York) during the fall, and as winter approached it was decided that it should go into winter quarters at Redding, as from this position it could support the important fortress of West Point in case of attack, intimidate the Cowboys and Skinners of Westchester County, and cover lands adjacent to Long Island Sound. Another major reason was to protect the Danbury supply depot, which had been burned by the British the year before but resurrected to keep supplies going to Washington's army. Colonel Aaron Burr, one of General Putnam's aides and a frequent visitor to Redding, had suggested that Putnam look over the area for a future winter encampment during a summer visit to General Heath's Brigade in Danbury. Putnam found the topography and location ideal. Three camp locations were marked and later prepped by artificers and surveyors under the direction of the Quartermaster staff: the first in the northeast part of Lonetown, near the Bethel line, on land owned by John Read, 2nd (now Putnam Park). The second was about a mile and a half west of the first camp, between Limekiln Rd. and Gallows Hill in the vicinity of present day Whortleberry Rd. & Costa Lane. The third camp was in West Redding, on a ridge about a quarter of a mile north of West Redding Station (vicinity of present day Deer Spring Drive & Old Lantern Road). The main camp, which is now known as Putnam Memorial State Park, was laid out with admirable judgement, at the foot of rocky bluffs which fenced in the western valley of the Little River. 116 huts were erected to form an avenue nearly a quarter mile in length, and several yards in width. At the west end of the camp was a mountain brook, which furnished a plentiful supply of water; near the brook a forge was said to have been erected. The second and third camps, were both laid out on the southerly slopes of hills with streams of running water at their base. Each of the camps were strategically positioned to defend main highways in and out of town: Danbury to Fairfield; Danbury to Norwalk; Redding to Danbury and points north (stage coach route). As to the exact location of Putnam's headquarters, authorities differ, but all agree in placing it on Umpawaug Hill. Some of Putnam's officers were quartered in a house later owned by *Samuel Gold (Limekiln Rd. ); others in a house later occupied by *Sherlock Todd (also on Limekiln Rd). General Parsons' headquarters were at Stephen Betts Tavern on Redding Ridge. While the army lay at Redding several events of importance occurred, which are worthy of narrating with some degree of particularity. The troops went into winter quarters this year in no pleasant humor, and almost in the spirit of insubordination. This was peculiarly the case with the Connecticut troops. They had endured privations that many men would have sunk under-the horrors of battle, the weariness of the march, cold, hunger, and nakedness. What was worse, they had been paid in the depreciated currency of the times, which had scarcely any purchasing power, and their families at home were reduced to the lowest extremity of want and wretchedness. The forced inactivity of the camp gave them time to brood over their wrongs, until at length they formed the bold resolve of marching to Hartford, and their grievances in person to the Legislature then sitting. The two brigades were under arms for the purpose before news of the revolution was brought to Putnam. He, with his usual intrepidity and decision of character, threw himself upon his horse and dashed down the road leading to his camps, never slacking rein until he drew up in the presence of the disaffected troops. "My brave lads," he cried, "whither are you going? Do you intend to desert your officers, and invite the enemy to follow you into the country? Whose cause have you been fighting and suffering so long in-is it not your own? Have you no property, no parents, wives, children? You have behaved like men so far-all the world is full of your praises, and posterity will stand astonished at your deeds; but not if you spoil it all at last. Don't you consider how much the country is distressed by the war, and that your officers have not been any better paid than yourselves? But we all expect better times, and that the country will do us ample justice. Let us all stand by one another then, and fight it out like brave soldiers. Think what a shame it would be for Connecticut men to run away from their officers." When he had finished this stirring speech, he directed the acting major of brigades to give the word for them to march to their regimental parades, and lodge arms, which was done; one soldier only, a ringleader in he affair, was confined to the guard house, from which he attempted to escape, but was shot dead by the sentinel on duty- himself one of the mutineers. Thus ended the affair, and no further trouble was experienced with the Connecticut troops. Soldiers: One room hut (14' X 16'), One Fireplace, Dirt Floors, 12 Men to a hut, Soldiers received rations and salaries only when available. Officers: Two room hut (14' X 22'), Two Fireplaces, Dirt Floors (sometimes wooden, if available), No more than 2 to 4 men in each hut, Officers were one of the first to receive available rations. Commanding Officers: Housed in-town in real houses with families, Did not suffer the harsh conditions of cramped living spaces and winter weather, First to receive salaries and rations. Adjutant: an officer who acts as military assistant to a more senior officer. Brown Bess: A soldier's fire-lock (musket). "To hug Brown Bess" is to carry a fire-lock, or serve as a private soldier. Cur: A cut or curtailed dog, disabled from chasing game. Figuratively used to signify a surly fellow. Flip: Small beer, brandy, and sugar. Fusillade: A discharge from a number of firearms, fired simultaneously or in rapid succession. A rapid outburst or barrage: a fusillade of insults. Gill: One gill is equal to 1/2 cup of liquid. Soldiers were allowed a gill of Rum per day when on fatigue, and at no other time. Grog: Rum and water. "Groggy" or "Groggified" is to be drunk. Ground Arms: To stack firearms on the ground. Hook: To steal. "My shirt was worn so I headed out of camp to hook one." Huzza: Said to have been originally the cry of the huzzars or Hungarian light horse; but now the national shout of the English, both civil and military; to give three cheers being to huzza thrice. Lobster(Back): A British soldier, from the color of his clothes (Red). Loggerhead: A blockhead or stupid fellow, also a double-headed, or bar-shot of iron. Neck Weed: Hemp. Used as rope in the time period. Pottage: A thick soup. Rod: A measurement of width, 16.5 feet is a rod. Sallied: Usually means to breakout or depart. Surly: Unfriendly, crabby, grumpy. Used to describe someone of that nature: "Major Williams was a surly fellow." Sutler: A sutler or victualer is a civilian who sells provisions to an army in the field, in camp or in quarters. Tattoo: A beat of the drum, or signal for soldiers to go to their quarters, and a direction to the *sutlers to close the tap. * A sutler or victualer is a civilian who sells provisions to an army in the field, in camp or in quarters. Trainband: Local Militia. Volunteer soldiers formed to protect townships. Vanguard: The foremost position in an army or fleet advancing into battle. Anvil: A heavy steel faced iron block. Breeches: Trousers ending above the knee. Ciphering: Transforming a message into secret code via math. Cholera: An acute infectious disease of the small intestine, caused by the bacterium Vibrio Cholerae. Commissary Notes: A Commissary is a store or market for military personnel, so a Commissary Note is a certificate given in lieu of currency for use in the store. Drover: One that drives cattle or sheep to market. Forage: The act of looking or searching for food or provisions. Fusillade: A rapid outburst or barrage: a fusillade of insults. Hardtack: A hard biscuit or bread made with only flour and water. Hogshead: Any of various units of volume or capacity ranging from 63 to 140 gallons. Jerked Beef: Long slices or strips of beef dried in the sun or near a fire. Johnny Cake: Cornmeal bread usually shaped into a flat cake and baked or fried on a griddle. Leggings: Tight, form-fitting trousers that extend from the waist to the ankles. Loft: Unpartitioned room overlooking another room. Plowshare: The cutting blade of a plow. Populace: The general public; the masses. A population. Scrip: A piece of paper representing or acknowledging value, such as a receipt or certificate, given in lieu of currency. Seining: To catch or fish with a net. Sloth: Aversion to work or exertion; laziness. Shilling: A coin worth one twentieth of a pound. Thatch: A house roof made with a plant material (such as straw). John Beach, missionary of the Church of England in Redding, was born in Stratford, Conn., October 6, 1700. His father was Isaac Beach, son of John Beach who came from England in 1643. He graduated from Yale College in 1721. He married, first, Sarah (last name unknown), who died in 1756; and second, Abigail Holbrook, who after his death returned to Derby. He had in all nine children. Those who had families were: Joseph, born September 26, 1727; Phebe, born 1729, married Daniel Hill of Redding, died in 1751, leaving son Abel. John born 1734, married Phebe Curtis, died in 1791. Lazarus, born 1736, had two children, viz. Lazarus, born 1760, and Isaac, born 1773. Lazarus inherited his father's land in Redding, at Hopewell, near which he built his house. Lazarus Beach, Jr., was of a literary turn, and edited a paper at Bridgeport, and afterward at Washington, D.C. On his journey to the latter place he lost his trunk or valise, containing the Beach manuscripts, and all his materials gathered for the purpose of writing a memoir of his distinguished grandfather. He built his house now standing near Mr. Godfrey's(Chestnut Woods near the bethel line). Isaac Beach built the house now occupied by Hull B. Bradley. The Rev. John Beach lived about thirty to forty rods south of the church, probably on the site of the old Captain Munger house, which has long since disappeared. The well is still used by Mr. E.P. Shaw. Lucy, daughter of the Rev. John Beach, married Rev. Mr. Townsend, and was lost at sea on her passage to Nova Scotia, probably at the time of the great exodus of Loyalists after the Revolution. The mother of James Sanford, Sen., was the daughter of Lazarus and great-granddaughter of Rev. John Beach. Lieutenant Stephen Betts, a prominent character in the Revolution, lived on Redding Ridge, in a house that stood on the corner, nearly opposite the former residence of Francis A. Sanford. He was an active Patriot, and was taken prisoner by the British on their march to Danbury in 1777. He had a son Daniel, and two or three daughters, of whom I have no record. His son Daniel was a merchant for a while on Redding Ridge and then removed to New Haven, where some of his children are now living. In 1766, Betts moved from the Boston District of Redding (Southeast Corner) to Redding Ridge (Northeast Corner) buying land from his distant relative William Hill. He opened a tavern and store on Redding Ridge, and became prominent in town politics. Congregational Church member. Among the earliest settlers of Redding were Jehu, Stephen, and Peter Burr, sons of Daniel Burr, of Fairfield, and brothers of the Rev. Aaron Burr, President of Princeton College. They all appear at about the same time, viz. 1730. In October of that year Stephen Burr was elected a member of the first Society Committee of the parish. He married Elizabeth Hull, June 8th, 1721. Children: Grace, born December 12th, 1724. Elizabeth, born January 17th, 1728. Hezekiah, born September 1st, 1730. Sarah, born November 9th, 1732. Martha, born March 24th, 1735. Esther, born February 5th, 1743. Rebecca. He married, second, Abigail Hall, of New Jersey. He lived in a house that stood where Dr. Gorham later built his residence. His only son, Hezekiah, died December, 1785, unmarried. Of the daughters, Grace married Daniel Gold, Elizabeth married Reuben Squire, Sarah married Joseph Jackson, Martha married Zacariah Summers. Esther married Anthony Angevine, and Rebecca married Seth Sanford. Deacon Stephen Burr died in 1779. Of him Colonel Aaron Burr wrote in his journal in Paris: "My uncle Stephen lived on milk punch, and at the age of eighty-six mounted by the stirrup a very gay horse, and galloped off with me twelve miles without stopping, and was I thought less fatigued than I." Peter Burr first appears in Redding as a clerk of a society meeting held October 11th, 1730. His children were: Ellen, baptized September 19, 1734. Sarah, baptized February 21st, 1736. Ezra, baptized January 2d, 1737. Edmund, baptized September 28th, 1761. Peter Burr died in August, 1779. His children shortly after removed to Virginia. Jehu Burr and wife were admitted to church membership in Redding, December 24th, 1738. None of his children were recorded in Redding, and none, so far as known, settled there. He owned property in Fairfield, and probably spent the last years of his life there. Jabez Burr, son of Joseph Burr, of Fairfield, and his wife Elizabeth, appear in Redding as early as 1743. Their children were Elijah, baptized May 15th, 1743. Nathan, born January 1st, 1745. Jabez, birth date unknown, Ezekiel, born March 23rd, 1755. 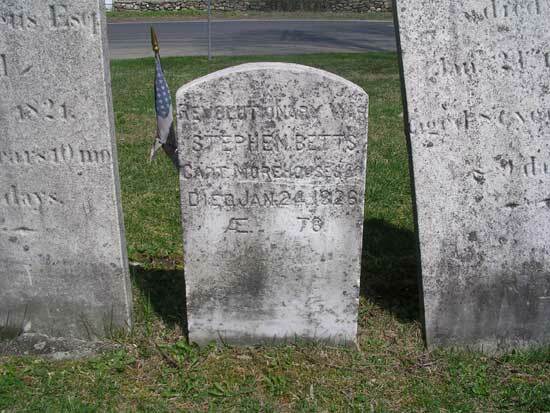 Stephen, born January 16th, 1757. Joel, born September 9th, 1759. Eunice, Huldah, and Hannah. Jabez Burr died in 1770. He is said to have settled in the Saugatuck Valley, near the present residence of Stephen Burr, and to have built there the first grist mill in the town. Of his children, Elijah married Roda Sanford, April 2d, 1767, and had children-Lemuel and Elizabeth; and by a second wife-Eunice Hawley, married April 27th, 1773-Joseph, Roda, John(who died of yellow fever in the West Indies), and Lucy, who married Jonathan Knapp, of Redding. Nathan, the second son, removed to Pawlings, Duchess Co., N.Y., in 1792, and there founded a numerous and wealthy family. Jabez, the third son, married Mary, daughter of Paul Bartram, and removed to Clarendon, VT., in 1786. He had one son, Aaron. Ezekiel, married Huldah Merchant, of Redding, who bore him three children: Aaron, who lived and died in the house now owned by Captain Davis; William, who removed to Kentucky in 1816; and Huldah, who married Daniel Mallory in 1806, and removed to the West. A son of William Burr is now President of the St. Louis National Bank. Another son, George, a teller in the same institution, was the companion of Prof. Wise in his late fatal balloon expedition, and shared the fate of the aeronaut. Stephen Burr married Mary Griffin, of Redding. his children were: Clara, Mary, Stephen, and Ezekiel. Joel Burr married Elizabeth Gold and settled in Ballston Springs, N.Y.
Mr. John Read, perhaps the earliest settler of Redding, was one of the most eminent men of his day. He was born in Connecticut in 1680, graduated from Harvard College in 1697, studied for the ministry, and preached for some time at Waterbury, Hartford, and Stratford. He afterward studied law, and was admitted an attorney at the bar in 1708, and in 1712 was appointed Queen's attorney for the colony. In 1714 he bought of the Indians a large tract of land in Lonetown and settled there. He continued to reside in Redding until 1722, when he removed to Boston, and soon became known as the most eminent lawyer in the colonies. He was Attorney-General of Massachusetts for several years, and also a member of the Governor and Council. He died in February, 1749, leaving a large estate. His wife was Ruth Talcott, daughter of Lieutenant-Colonel John Talcott, of Hartford, and sister of Governor Joseph Talcott. They had six children: Ruth, born (probably) in Hartford in 1700; died in Redding, August 8, 1766. She was the wife of Rev. Nathaniel Hunn, first pastor of the church in Redding. They were married September 14, 1737. John, born in Hartford in 1701; lived in Redding at the "Lonetown Manor" and was a leading man in his day in the colony; was much in public life, both civil and military, and was noted for his public spirit, patriotism, and piety. He married twice. His first wife was Mary (last nme unknown), a Milford lady. His second wife was Sarah Bradley, of Greenfield Hill. His children were: William, who married Sarah Hawley, of Redding. Zalmon, who married Hulda Bradley, of Greenfield. Hezekiah, who married Anna Gorham. John, who married Zoa Hillard. Mary, wife of John Harpin. Sarah, wife of Jabez Hill, and afterward of Theodore Monson. Ruth, wife of Jeremiah Mead. Deborah, wife of Thomas Benedict, a lawyer. Mabel, wife of Levi Starr; and Esther, wife of Daniel C. Bartlett, son of Rev. Nathaniel Bartlett. One of his children, a lad of four years, fell into a burning coal pit in 1739, and was so badly burned that he survived but a few hours. His father wrote a letter to his father in Boston, informing him of the meloncholy event, and his father sent back a letter in reply. Both of the letters are yet preserved, after a period of one hundred and forty years, and are both remarkable for the piety and Christian resignation manifested in them. William, born in Connecticut about 1710, was a lawyer in Boston, and afterward a judge in several of the courts there. He lived a bachelor, and died in 1780, aged seventy-years. Mary, born (probably) in Reading, Conn., April 14, 1716; married Captain Charles Morris, of Boston, afterward of Halifax, Nova Scotia, where he was for many years chief justice of the courts. They had nine sons and two daughters. Abigail married Joseph Miller, of Boston. Deborah married a Mr. Willstead, and afterward Henry Paget, of Smithfield, Rhode Island. Thomas Fitch Esq., Governor and Commander in chief of his Majesty's Colony of Connecticut in New England. To John Read Esq., Greetings. Whereas you are appointed by the General Assembly of said Colony to be Colonel of the fourth Regiment of Horse in said Colony. Reposing special trust and confidence in your Loyalty, courage, and good conduct, I do by these presents constitute and appoint you to be Colonel of said Regiment. You are therefore to take the said Regiment into your care and charge as their Colonel, and carefully and dilligently to discharge that care and trust in ordering and exercising of them, both officers and soldiers in arms according to the rules and discipline of war, keeping them in good order and government, and commanding them to obey you as their colonel for his Majesty's service, and they are to conduct and lead forth the said Regiment, or such part of them as you shall from time to time receive orders for from me, or from the Governor of this Colony for the time being, to encounter, repel, pursue, and destroy by force of arms, and by all fitting ways and means, all his Majesty's Enemies who shall at any time hereafter in a Hostile manner, attempt or enterprise the invasion, detriment, or annoyance of this Colony. And you are to observe and obey such Orders and Instructions as from time to time you from me, or other your Superior Officiers, pursuant to the trust hereby reposed in you and the laws of this Colony. Given under my hand and the seal of this Colony, in New Haven, the 3rd Day of November, in the 31st year of the Reign of our Sovereign Lord George the Second, King of Great Britain and Annoque Doms. 1757. John Read #3 was an Ensign for the Redding West Company which formed during the French and Indian War (Seven Year War) in 1754. Sadly, he died while on campaign in New York, September 23, 1757. Zalmon Read was Captain of the 10th Company, 5th Connecticut Regiment in 1757, which marched to Canada and engaged in battles at St. Johns and Montreal during the French and Indian War. Capt. Zalmon also assembled and led Redding's militia to Weston to unsuccessfully challenge Tryon's British troops as they marched toward Danbury on April 26, 1777. Zalmon and his brother Hezekiah later converted to the Episcopalian faith; Zalmon moved to Bedford, New York after the Revolution, Hezekiah remained in Redding and was a major landholder. James Rogers was a prominent man in his day, and filled many responsible offices in town. He appears as early as 1762. His children were: Joseph, born October 31, 1762. Chloe, born October 24, 1766. James, born April 28, 1768. Haron, born August 22, 1770. Samuel Sanford #1, settled in Umpawaug. He was Captain of the Redding West Company militia formed at the height of the French & Indian War in 1754. James Sanford, settled in the Foundry district. He was a teamster in the Revolutionary army, and was present at the execution of Jones and Smith on Gallows Hill. Lemuel Sanford settled in Redding center. He was one of the first committee men in the Congregational society, and prominent in public affairs, serving as an officer in the first Redding militia (trainband) formed in 1739. More Bio's can be found at the My Brother Sam is Dead Characters page. In my brother Sam is dead, Mr. Beach states: "I don't think the people of Redding are anxious to fight, Sam"
There were two separate companies of militia in Redding by 1755- One (West militia) commanded by members of the Congregational society at Redding Center, the other (East militia) commanded by officers of the Christ Church Anglican society at Redding Ridge, these militias were formed in response to the French and Indian War (Seven Year War). It difficult to state they were anxious to fight, but they were certainly prepared to fight. The British marched on Lexington and Concord, Massachusetts in April of 1775. In June/July 1775, several members of both militia's (East & West) comprised the 10th Company, 5th Connecticut Regiment which joined other colonial militias for the Invasion of Canada. Zalmon Read, Ezekiel Sanford, David Peet and Benjamin Nichols appear as officers in William E. Grumman's recorded history on Redding and the Revolution, titled Revolutionary Soldiers of Redding. Most Redding soldiers returned in November of that same year, though some did remain during the siege of Montreal that winter. The musket Sam takes from his father in my brother Sam is dead, was a Brown Bess "Long Land" musket with a 46" barrel length, .75 barrel caliber, .69 bullet caliber, and bayonet length of 16"-17". Popular explanations of the use of the word "Brown" include that it was a reference to either the color of the walnut stocks or to the characteristic brown color that was produced by russeting, an early form of metal treatment applied to lessen the shine of the barrel in the field. The word "Bess" is commonly held to either derive from the word "arquebus" or "blunderbuss" (predecessors of the musket) or to be a reference to Elizabeth I of England, considered unlikely as she died more than a century before the introduction of the weapon. More plausible is that the term Brown Bess could have been derived from the German words "brawn buss" or "braun buss", meaning "strong gun" or "brown gun"; King George I who commissioned its use was from Germany. Redding is portrayed as a Tory town in my brother Sam is dead but town records contain very few references to the Loyalists of Redding during the Revolutionary period. They most certainly existed, and prior to the war openly disapproved of opposing the British Government, stating "a firm dependence on the Mother Country is essential to our political safety and happiness." Many, if not all, of Redding's Tories were Anglican Church members. Anglicans were in a difficult position, their choice of religion was tied closely to the crown of England and a split from England left them with an uncertain future. Congregationalists did not have these ties, so for them it was a matter of right or wrong…did they agreed with the actions of England's leaders or disagree. The confusion of the Tories/Loyalists is explained by Tim Meeker in Chapter 2, "Ever since I could remember, all my life in fact, there had been discussions and arguments and debates about whether we ought to obey His Majesty's government or whether we should rebel. What kept confusing me about it was that the argument didn't have two sides the way an argument should, but about six sides." It should be noted that many Anglicans were angered by the actions of England's leaders, but felt a Rebellious split from England was excessive and a diplomatic approach to the issues was in the best interest of all colonists involved. Redding's Tories referred to themselves as the Redding Loyalist Association. The Redding Loyalist Association was led by the son of John Beach, Lazarus. In February of 1775, they and other Tories living in Fairfield County published an article in a New York publication proclaiming their loyalty to the King. 1st Resolved, that while we enjoy the privileges and immunities of the British Constitution we will render all due obedience to his most Gracious Majesty King George the Third, and that a firm dependence on the Mother Country is essential to our political safety and happiness. 2nd Resolved, that the privileges and immunities of this Constitution are yet (in a good degree) continued to all his Majesty's American subjects, except those who, we conceive, have justly forfeited their rights thereto. 3rd Resolved, that we supposed the Continental Congress was constituted for the purpose of restoring harmony between Great Britain and her colonies and removing the displeasure of his Majesty toward his American subjects, whereas on the contrary some of their resolutions appear to us immediately calculated to widen the present unhappy breach, counteract the first principles of civil society, and in a great degree abridge the privileges of their constituents. This document was signed by 141 Freeholders and Inhabitants of the town of Reading and the adjoining parts in the County of Fairfield but the signers were not revealed by the publisher, James Rivington. Historian Charles Burr Todd wrote: "The effect of this document on the Patriots of Redding was like that of a red flag on a bull. They at once set to work to discover its signers and presently made public in a circular the entire list so far as they belonged to Redding. It was given out by the Committee of Observation under this preamble:"
"Whereas, there was a certain number of resolves published- and whereas said Resolves are injurious to the rights of this Colony, and breath a spirit of enmity and opposition to the rights and liberties of all America and are in direct opposition to the Association of the Continental Congress: and notwithstanding said resolutions were come into with a seeming view to secure the said signers some extraordinary privileges and immunities, yet either through negligence in the printer or upon design of the subscribers, said signed names are not made public - and now if there be any advantage in adopting those principles we are willing they should be entitled there to; and for which end and for the more effectual carrying into execution and Association we have taken some pains and by the assistance of him who carried said resolves to said Printer we have obtained the whole of said names." The Committee of Observation added: "There are only 42 Freeholders in the above number. There are several minors, etc. that make the above number of 74 that belong to said Reading, and we hereby hold them up to the public as opposers to the Association of said Congress." Signed by the order of the Committee of Observation for said town of Reading. Ebenezer Couch, Chairman." The entire list of Redding Loyalists was published by the Committee of Observation for all to see, publicly exposing the signers and placing them in great danger among their Patriotic neighbors. Not all of those who had signed were ardent adherents to the British cause, and the "pressure" applied by the Patriots in publishing the names of the signers caused some to realign themselves with the Patriot cause. Those remaining adamantly against the War of Independence fled to the safety of the British lines, while the majority simply fell silent opting for their trusted and beloved church leader, Rev. John Beach's policy of passive resistance in the Revolutionary period. In 1775, a number of loyalists in town signed what was essentially a neutrality agreement, saying they would not bear arms on the side of the British and would not discourage enlistment in the American army. Rev. John Beach was one of these signers and perhaps it was concessions such as this agreement that allowed the Anglican community to survive in Redding, while other Anglican parishes in Connecticut dwindled and the ministers of some of them went either into exile or were jailed. Redding Tories that chose not to heed the warnings and yield to the Patriots were fined and imprisoned. "Lazarus Beach, Andrew Fairchild, Nathan Lee, Enos Lee, and Able Burr of Reading, in the county of Fairfield, being Tory convicts and sent by order of law to be confined in the town of Mansfield to prevent any mischievous practices of theirs, having made their escape and being taken up and remanded back to his Honor the Governor and this Council, to be dealt with." "Resolved, and ordered by the Governor and his Council aforesaid, that the said Lazarus Beach (etc…) be committed to the keeper of the goal in Windham, within said prison to be safely kept until they come out thence by due order of the General Assembly, or the Governor and his Council of Safety, and that they pay cost of their being apprehended and being remanded, etc…, allowed to be 25 pounds, 3 shillings. Mittimus granted Jan. 28, 1777." On Feb. 10, 1777, Beach, Burr, and Fairchild were ordered to "return to Mansfield and there abide under the direction of the Committee of Inspection of that town, while Enos and Nathan Lee were permitted to return home on their giving bonds for their good behavior." Though he headed efforts to protect the safety of his church societies, one agreement Rev. John Beach refused to comply with was the omission of the King's prayer in his church services. This position brought upon him the active persecution of radical Patriots like the Sons of Liberty. Dear Sir: We have no disposition to restrain or limit you or others in matters of conscience. But understanding that you, in your Public Worship, still continue to pray that the King of Great Britain may be strengthened to vanquish and overcome all his enemies, which manner of praying must be thought to be a great insult upon the Laws, Authority, and People of this State, as you and others can but know that the King of England has put the People of these United States from under his protection, Declared the Rebels, and is now at open war with said States, and consequently we are his enemies. Likewise you must have understood that the American States have declared themselves independent of any Foreign Power - Now Sir, in order that we may have peace and quietness at home among ourselves, we desire that for the future you would omit praying in Public that King George the third or any other foreign Prince, or Power, may vanquish, etc… the People of this Land. Your compliance herewith may prevent you trouble. We are, Rev. Sir, with due Respect, your obedient humble servants. To the Revd. John Beach. Lemuel Sanford, William Hawley - Justices Hezekiah Sanford, Seth Sanford, Thaddeus Benedict, John Grey, William Heron - Selectmen of Redding"
Mr. Beach, however, continued to read the prayers for the King vowing that he would "do his duty, preach, and pray for the King till the rebels cut out his tongue." "don't be alarmed, brethren. Fear not them which kill the body, but are not able to kill the soul; but rather fear Him which is able to destroy both soul and body in hell" and then proceeded with his discourses as if nothing had happened." The Rev. John Beach died in March of 1782, well before the peace treaty of September, 1783, but not as a result of a Rebel sword or bullet, simply old age. In many recorded histories, he is credited for maintaining a more tranquil community than others in Connecticut. Redding Tories: Issac Drew, Ephraim DeForest, John, Joseph and Peter Lyon, and Daniel Read, were among those whose land was confiscated by the State courts. Many others were fined for refusing to perform military duty but as a whole the Loyalists of Redding were a less tortured one - before, during and after the Revolution in comparison to others in the state, where recriminations against British sympathizers took the form of wholesale jailing and even murder. Lazarus Beach, most certainly a thorn in the patriot's side in the early stages of the conflict, eventually fell into rank and remained in Redding after the Revolution serving as selectman from 1788-1789. Proof that extreme measures were not taken against the Loyalists of Redding unless the person had actually gone over to the enemy to take up arms or screen themselves under the protection of the Ministerial Army. *Classroom Discussion: A question I receive often is: Could this happen in the present day? Could Americans overthrow their Government? The answer is No...it would be very difficult to accomplish that in a Rebellious fashion(politically maybe). But an interesting story is developing in Vermont, a town is so fed up with the current state of politics in America that they wish to secede from the US. While they will likely fail, the effort gives us a present day view of how Loyalists felt about Rebels in the Revolutionary period. We (the ones thinking they are crazy) are the Loyalists and they (and everyone that thinks "hey that's a good idea") are the Rebels. I've linked a list of Blog results from Google in case anyone wants to monitor the situation and use it as an educational tool. My Dropbook Sign up is hosted by FastSpring.com & linked to my company: Colley Web Services, LLC. Access is $12.99. Everything I have even found and everything I have written and created is available in the Dropbox. What's even cooler is that you have access to these files from any computer or device. Just log in to the Dropbox and the files are all there. The Colonies had only 31 ships comprising the Continental Navy at the time of their Declaration of Independence. To add to this, they issued Letters of Marque to privately owned, armed merchant ships and Commissions for privateers, which were outfitted as warships to prey on enemy merchant ships. The merchant seamen who manned these privateer ships contributed greatly to the Patriot cause. Relatively little is known or made of these brave Yankees who combined patriotism with profit, since their highly individualistic cruises rarely found their way into official records. The boats that roamed Long Island Sound were called "Spider Catchers". These boats were small and quick...30 feet in length and 8 tons on average. They were whaleboats outfitted with a small cannon and 12 armed men. While this doesn't sound too impressive, they were very effective when a group of them banded together to attack a larger target. More information on Cow-boys and Skinners page. The present town of Redding is one of the few places in the old Colony of Connecticut where the Episcopal ministry is entitled to the distinction of having been first on the ground, laying foundations, and not building upon those already laid. The Church of England was not planted in New England without strenuous and bitter opposition from the Puritans, who were first in the field. By old English law, indeed, that church was established in all the plantations; Set it is manifest from the records of the colonial legislation of the charter government of Connecticut, that previously to 1727, the church of which the king was a member was not recognized as having a right to exist. Congregationalism was the established religion. " In opposition to which there could be no ministry or church administration entertained or attended by the inhabitants of any town or plantation, upon penalty of fifty pounds for every breach of this act " and every person in the colony, was obliged to pay taxes for the support of this establishment. In this uncongenial soil the Anglican Church of Connecticut was planted--strange to say, not by foreign-born missionaries, but by seceders from the ministry of the Congregationalists. The pioneers in this movement were Timothy Cutler, Rector of Yale College, Daniel Brown, Tutor; James Wetmore, of North Haven; and Samuel Johnson, of West Haven, a former tutor in the college. These gentlemen, after a professedly careful and prayerful examination of the subject of church order; discipline, and worship, which resulted in a conviction that the English Church followed most closely the teachings of the Scriptures and the practice of the church of the first ages, sent to the trustees of the college a formal statement of their views, and declared for Episcopacy--to the no small surprise and consternation of their colleagues in the college and church. The four went to England for Episcopal ordination, where Brown died. The three survivors returned in 1722, as missionaries of the " Society for the Propagation of the Gospel in Foreign Parts," Johnson only being sent to Connecticut. The anti-Revolutionary history of the church at Redding Ridge is mostly to be found in the archives of this Society, as published in the "Documentary History of the Protestant Episcopal Church in Connecticut," and the Rev. Dr. Beardsley's "History of the Episcopal Church in Connecticut''-from which sources, mainly, this sketch has been compiled. A letter was addressed to the secretary of the S. P. G., dated October 19th, 1722, signed by John Glover and twelve other heads of families in Newtown, Thomas Wheeler, of Woodbury, and Moses Knapp, of Chestnut Ridge, thanking the Society for the services of the Rev. George Pigot, missionary at Stratford, and earnestly soliciting the appointment of a missionary for themselves at Newtown. The next year, 1723, Mr. Pigot was transferred to Newport, R. I., and the Rev. Samuel Johnson, his successor at Stratford, " accepted all his missionary duties in Connecticut." In 1727, the Rev. Henry Caner was sent to Fairfield, of which town Chestnut Ridge was a part. After having named in his report the several villages or hamlets in the vicinity of his station, he says: "Besides these, there is a village northward from Fairfield about eighteen miles, containing near twenty families, where there is no minister at all, of any denomination whatsoever; the name of it is Chestnut Ridge, and where I usually preach or lecture once in three weeks." In 1728 he says there are four villages " about Fairfield, --Green Farms, Greenfield, Poquannuck and Chestnut Ridge, three of them about four miles distant, the last about sixteen. The same year, the name of Moses Knapp appears as a, vestryman of the church at Fairfield. Mr. Caner reported seven families at Chestnut Ridge; the number reminding us of the "House of Wisdom" with its '"Seven Pillars," as the first Puritan organization at New Haven was named. It is because of these records that we state that Redding is one of the few places in the old Colony of Connecticut where the Episcopal ministry is entitled to the distinction of having been first on the ground, laying foundations, and not building upon those already laid. In 1729, "Moses Knapp, Nathan Lion, and Daniel Crofoot" objected, in a meetings of the [Presbyterian] '' Society of Redding " against the hiring of any other than a minister of the Church of England. The Rev. Dr. Burhams [Churchman's Magazine, 1823] says: "'The first Churchman in Reading was a Mr. Richard Lyon, from Ireland, who died as early as 1735.'' He also says on the authority of " an aged member of the Church in Reading," that "Messrs. Richard Lyon, Stephen Morehouse, Moses Knapp, Joshua Hall, William Hill, Daniel Crofoot, and Lieut. Samuel Fairchild, appear to have composed the first Church in Reading." Mr. Caner was succeeded at Chestnut Ridge, in 1732, by the Rev. John Beach, a pupil of Johnson in Yale College, and afterward Presbyterian minister at Newtown for several years. As Mr. Beach was a resident of East Redding for about twenty years, and pastor of this church full half a century, his history is substantially that of the parish, or mission, over which he presided. His pastorate was the longest of all the anti-Revolutionary clergy. The longest pastorate since Mr. Beach was that of his great-grandson, the Rev. Lemuel B. Hull, who resigned his charge in 1836, after twelve years service. The layout of a typical tavern in colonial times had several small rooms and one large room on the main level. In many cases houses were converted into taverns, formal living rooms became parlors where lady travelers could rest and dining rooms became taprooms where beer and cider were served. The larger room, what we consider a "family room" or "great room" today, was usually located at the front of the tavern and was used as the main dining room. This main dining room was filled with a mixture of small and large tables, typically it had a fireplace and several comfortable chairs around it. The main room was also used for meetings, court hearings, and social gatherings. The tavern's sleeping quarters were located upstairs. In the early days, it wasn't uncommon for visitors to share rooms or even a bed. Later, private rooms were added to some taverns, similar to Bed and Breakfasts/Inns of the present day. The kitchen location varied, in some cases it was in the back of the house, in others downstairs in the basement, a separate building out back was possible too. Behind the tavern, there was an outhouse or backhouse (i.e. bathroom) and often a stable where travelers could rest their horses. Almost all colonial taverns were located on main highways or turnpikes. Signs were essential and since many people in colonial times could not read, a sign with a picture was a necessity. Tavern signs were often carved from wood, but some were also painted on plaster or cast in metal. In the Revolutionary period the name of the tavern sometimes reflected the allegiance of it's tavern keeper. A tavern named, The King's Arms, indicated an allegiance to England. A tavern named The Washington Tavern, indicated the tavern keeper sided with the American patriots. In colonial times a night's stay at a tavern, including meals, lodging and stable space for the traveler's horse might cost about $2.00. Here are the prices charged by one colonial tavern: Lodging - $.12 ½, Breakfast - $.37 ½, Dinner - $.50, Supper - $.37 ½, Lodging for the horse - $.50. "In the middle of the 18th century, taverns lay at the center of life in the British American mainland colonies. People ate, drank, and slept there; they read mail and papers and in other ways got the news; they boarded stages from and voted at taverns; they attended court hearings and committed crimes. Tavern keepers themselves were often respected and influential citizens, and tavern keeping was viewed as an important and economically viable occupation, including for women. As a point of fact, taverns were everywhere, they housed everything, and everyone could be involved. They were the social and cultural centers of colonial life." To serve the needs of the army, the Continental Congress began to issue indented draft certificates. These were basically I.O.U. 's issued by government departments for all types of payments. They became known as "commissary notes" because they were most actively used by the commissary quartermaster, who would seized items needed for the military and leave the owner with a certificate promising future payment. At the close of the war, these notes became war debts and a major concern of the Confederate Congress. There were notes due to officers and enlisted men for wages, bonuses and pensions; accounts with commissary quartermaster, hospital, and other officers who had disbursed money during the war; and debts owed to individual suppliers. The Congress with little revenue to pay these debts selectively reimbursed individuals. Claims for reimbursement on record in New York State range from 1782 to 1794 and it's doubtful all claims were paid. In many cases, the patriots that had risked their lives and well being, either needing cash or convinced they would never be repaid, had sold their certificates to speculators for a pittance. Danbury was first settled by colonists in 1685, when eight families moved to the area from the area that is now Norwalk and Stamford. The Danbury area was then called Paquiaqe by the Paquioque Native Americans. One of the first settlers was Samuel Benedict who bought land from the Paquioque natives in 1685 along with his brother James, James Beebe, and Judah Gregory. The settlers originally chose the name Swampfield for their town, but in October 1687, the general court decreed the name Danbury. During the American Revolution, Danbury was an important military depot. In April 1777, the British under Major General William Tryon burned and looted the city. American General David Wooster was killed in the Ridgebury section as his troop pursued the British on their way out of the city. Joseph Platt Cooke was commander of the 16th militia regiment when the British burned Danbury on April 26 and 27, 1777. His own home, which he had built at 342 Main Street, Danbury in 1770, was partially destroyed by fire. He resigned his position of "colonel" early in 1778. In the summer of 1781 his home served as a meeting place for George Washington and the French military leaders, the Comte de Rochambeau and the Marquis de Lafayette when the French army marched through Danbury, Connecticut. The central motto on the Seal of the City of Danbury is Restituimus (Latin for "We have restored"), a reference to the destruction caused by the British army. In 1639 soon after the Pequot War, Roger Ludlow, a founder of the colony of Connecticut, led a small group of men and a herd of cattle to a place known to the local Paugausetts as Unquowa. They established a settlement that was named for the acres of salt marsh that bordered the mainland shore across from Long Island. 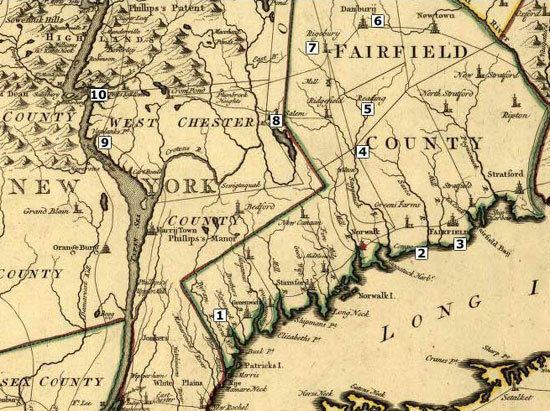 When the Revolutionary War began, Fairfielders were caught in the crisis as much as if not more than the rest of their neighbors in Connecticut. 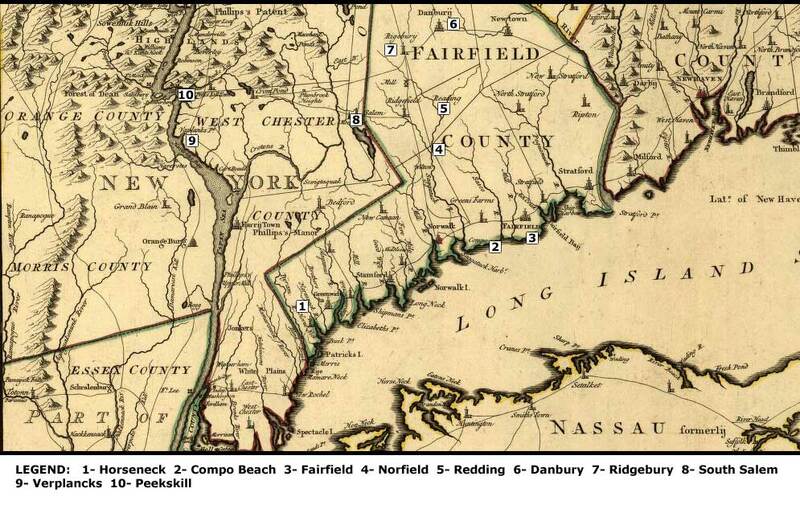 In a predominantly Tory section of the state, the people of Fairfield were early supporters of the cause for independence (Patriots). Throughout the war, a constant battle was being fought across Long Island Sound as men from British-controlled Long Island raided the coast in whaleboats and privateers. Gold Selleck Silliman, whose home still stands on Jennings Road, was put in charge of the coastal defenses. In the spring of 1779, Silliman was kidnapped from his home by Tory forces in preparation for a British raid on Fairfield County. His wife watched from their home as, on the morning of July 7, 1779, approximately 2,000 enemy troops landed on Fairfield Beach near Pine Creek Point and proceeded to invade the town. When they left the following evening, the entire town lay in ruins, burned to the ground as punishment for Fairfield's support of the rebel cause. Ten years later, President George Washington noted after traveling through Fairfield, that " the destructive evidences of British cruelty are yet visible both in Norwalk and Fairfield; as there are the chimneys of many burnt houses standing in them yet." Fairfield recovered slowly from the burning, but soon after the end of the war its houses and public buildings had all been rebuilt. The parish of Horseneck was located in present day Greenwich, Connecticut. There were once two societies in Greenwich (the parish of Greenwich and the parish of Horseneck) which eventually merged, Horseneck was in the Western section of present day Greenwich. Israel Putnam made Horseneck famous in 1777 with his infamous ride down a steep embankment to avoid capture by the British. Surprised and outnumbered by William Tryon's British forces, Putnam hastily retreated through a nearby swamp. His line of retreat brought him to the top of a steep cliff where, rather than face capture, Putnam chose to risk the descent. Because the British were disinclined to follow his treacherous path, Putnam, at age 60, made good his escape. This ride was brought to life by sculptress Anna Hyatt Huntington in the form of a bronze statue that today welcomes visitors to Putnam Memorial Park in Redding, Connecticut.
" a drover from Norfield had been shot on the Ridgebury Road two days earlier"
Norfield today is a section of Weston, Connecticut. The name originates from "North Fairfield" as the town of Weston was once part of Fairfield and was settled by many second-generation Fairfielders. The Norfield Congregational Church celebrated its 250th anniversary in 2007. Settled in 1731, its original name was Upper Salem. Today North Salem is an equestrian's paradise; some people say in jest that there are more horses than people. North Salem is bounded on the east by Ridgefield, Connecticut, on the north by Putnam County, on the south by the Town of Lewisboro and on the west by the Town of Somers. North Salem's two principal hamlets are Croton Falls and Purdys. New Amsterdam (New York City) resident Jan Peeck made the first recorded contact with the native tribal people of this area, then identified as Sachoes. The date is not certain, (possibly early 1640's) but agreements and merchant transactions took place, formalized into the Ryck's Patent deed of 1684. Peeck's Kil (Kil meaning 'stream' in the Dutch language) became the recognized name for this locale. By the time of the American Revolution, the tiny community was an important manufacturing center with a variety of mills along its several creeks and streams. These industrial activities attracted the Continental Army in establishing its headquarters here in 1776. The mills of Peek's Creek provided gunpowder, leather, planks, and flour. Slaughterhouses were an important part of the food supply. The river docks allowed transport of supply items and soldiers to the several other fort garrisons placed along the Hudson to prevent British naval passage between Albany and New York City. Officers at Peekskill generally supervised placing the first iron link chain between Bear Mountain and Anthony's Nose in the spring of 1777. Though Peekskill's terrain and mills were beneficial to the Patriot cause, they also made tempting targets for British raids. The most damaging attack took place in early spring of 1777 when an invasion force of a dozen vessels led by a warship and supported by infantry overwhelmed the American defenders. Another British operation in October 1777 led to further destruction of industrial apparatus. As a result, the Hudson Valley command for the Continental Army moved from Peekskill to West Point where it stayed for the remainder of the war. Mel Gibson was born in Peekskill, New York in 1956 (In 1968, his family moved to Australia); In the film The Patriot (2000) Mr. Gibson portrays Benjamin Martin, a peaceful farmer, driven to lead the Colonial Militia during the American Revolution when a sadistic British officer murders his son. Please view website for information on Redding, Connecticut. As early as 1697 Norwalk residents began to become interested in the land to the north of their community. Norwalk residents were informed that: "The upland was considerably good and sufficient for thirty families, and as for meadow land it surpasses both in quantity as well as in quality what is common to be found in larger plantations…and there were more than sixty miles of streams that could serve future mills." In September 1708, John Copp and two others from Norwalk representing the first 26 settlers of the new community to be named "Ridgfield" (later changed to "Ridgefield") paid the Indians (Chief Catoonah of the Ramapo tribe) £100 sterling for what was called "the first purchase" of which there were to be seven more. The purchase having been made, the General Assembly in session at Hartford in May 1709 appointed Major Peter Burr of Fairfield, John Copp of Norwalk, and Josiah Starr of Danbury, to serve as a committee to make a survey of the tract of land and to lay it out for a town plot, and to make return to the General Assembly at New Haven the following October. This was done, and a grant was made by the General Assembly in session at New Haven on October 13, 1709. The most notable 18th Century event was the Battle of Ridgefield (on April 27, 1777). This Revolutionary War skirmish involved a small colonial militia force (the Connecticut Continentals), led by, among others, General David Wooster, who died in the engagement, and Benedict Arnold, whose horse was shot from under him. The battle was a tactical victory for the British but a strategic one for the Colonials since the British never again attempted a landing by ship to attack inland colonial strongholds during the war. Today, the dead from both sides are buried together in a small cemetery in town "...foes in arms, brothers in death..."
The Keeler Tavern Museum, features a British cannonball still lodged in the side of the building. There are many other landmarks from the Revolutionary War in the town, most along Main Street. Ridgebury is between Danbury and Ridgefield. It was here that General David Wooster was mortally wounded. Verplanck is a hamlet located in the town of Cortlandt, Westchester County, New York; just south of Peekskill. It is less than a mile in total area, 11.54% water. Verplanck's Point was a defended position of the Continental Troops during the war, the British assaulted the forts of Stony Point and Verplanck's Point in 1779. Between Verplanck's Point and Stony Point was King's Ferry, the most heavily used crossing on the Hudson River. On August 31, 1782, an Amphibious assault was conducted by Continental troops moving the army from New Windsor to Verplanck's Point as rehearsal for an assault on Manhattan. "Washington's Hill" marks the site of one of the nation's most splendid military reviews, where Washington and Rochambeau staged a welcome to the French and American armies in 1782. Locals proudly to call themselves "Pointers". Verplanck is the home of a replica of the ship the Half Moon, with which Henry Hudson explored the Hudson River. Online presentation about Redding Ridge and My Brother Sam is Dead. All my presentations for Redding and My Brother Sam is Dead topics. For those who wish to have access to all I know, I have created a Dropbox account that is available by subscription only. Not finding what you're looking for? Google it!